27 years, 6 months, 2 days old age. Jaydev Unadkat will turn 28 on 18 October, 2019. Only 5 months, 27 days, 12 hours, 6 minutes has left for his next birthday. Jaydev Unadkat has celebrated the total number of 27 birthdays till date. See the analysis by days count and bar graph. He was born on 18-10-1991 in Porbandar in the state of Gujarat, India. He is an Indian Cricket Player who plays for Rajasthan Royals in the Indian Premier League. Unadkat did his schooling from St. Mary's School, Porbandar. Unadkat used to learn cricket as a day scholar here. His first cricket coach Ram Odedra saw his bowing and he was so impressed by seeing his manner of bowling action and putting his ball on the pitch seemed to be very productive. Jaydev Unadkat was selected for the first time in the Indian team for the Test series against Australia, but he did not get a chance to play any match. On 16 December 2010, he played his first Test match against South Africa in Centurion. Zaheer Khan was picked for his injury. However, he bowled 26 overs and did not get any wicket with 101 in the entire match. Since 2011, he failed to show any remarkable performance, so it was hard for the selectors to keep him in the Indian squad. Jaydev Unadkat played his first T20 International match against Zimbabwe on 18 June 2016 at Harare Sports Club. Jaydev Unadkat was chosen for the first time under the leadership of fast bowling in Team India for the Under-19 World Cup played in New Zealand in 2010. In June 2010, he was given a place in India A team going to England. In the first match against West Indies A, he showed his excellency by scoring103 runs and also taking 13 wickets. His journey in IPL was quite impressive first he started playing from Kolkata Knight Riders from 2010-2012. But in 2013 IPL by seeing the talent of this young player the Royal Challengers Bangalore bought them for $ 525,000 in the 6th edition of IPL, which was one of the most expensive players. 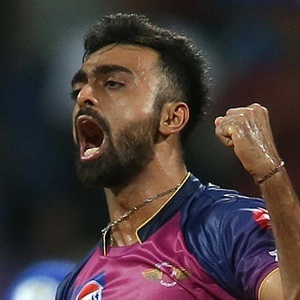 On May 10, 2013, Jaydev Unadkat, in a match against Delhi Daredevils, struck 5 wickets in 25 balls with four wickets in four overs and helped his team win. He also got Man of the Match for this performance. In the seventh edition of IPL on 12 February 2014, Delhi Daredevils bought him for 2.80 crores. In 2016 IPL tournament he was again retained by the Kolkata Knight Riders to make his faith on Unadkat to pitch the wicket-taking bowling in this season and he was bought at an expensive price of 2.5 million dollars. But in this season his performance was ineffective. In the bid of 2018 IPL, Jayadev has been associated with the Rajasthan Royals with a surprising bid of Rs 11.5 crore. He has also got some chances at International level but has failed to impress and was thus dropped. He was born to Deepak Unadkat. He has a sister named Dheera Unadkat. He played his first T20 International match against Zimbabwe on 18 June 2016 at Harare Sports Club. He played the U-19 World Cup in 2010 and was among the best Indian bowler during that tournament. Thus far in his career, he has played just 1 Test match. He has been a part of almost all IPL seasons since 2010 but made headlines during IPL 10 after he single-handedly won Pune Supergiants matches with magical spells. Next year during IPL player auction 2018, Rajasthan Royals had to shell out 11.5 crores for his services.